Dan Visconti has a knack for titles. The young composer, who studied with Margaret Brouwer at the Cleveland Institute of Music and Aaron Jay Kernis at Yale, is so adept at naming his pieces that it’s nearly impossible to listen to his music without the title’s image blossoming in the brain. Take for instance the small ensemble piece, Drift of Rainbows (2009), included on Lonesome Roads, a 2012 Bridge Records release by the Scharoun Ensemble Berlin and the Horszowski Trio of some of Visconti’s chamber music. Ecstatic strings surge and arc over majestic chords like, well, rainbows drifting through the air. One reason Visconti’s titles are so successful is the pictorial quality of his work. He creates vivid paintings in sound, depicting the vast fields of America and the people that populate them by incorporating vernacular music. Black Bend (2003), for string quartet and bass, is an inventive romp through the blues, with strings wailing in imitation of a soulful singer. The violin and harp piece, Lawless Airs (2008), takes cowboy songs as its starting point. While harp strums mimic a guitar, the violin croons a lyrical plaint, like a lonely cowboy singing by a campfire. As darkness surrounds him, the song breaks down, but he quickly finds solace again in the quiet beauty of the countryside. Visconti excels when he ventures into the world of the barn dance, where foot-stomping grooves and fiery fiddling reign. His first published piece, Hard-Knock Stomp (2000), in a version for solo cello, features the kind of bending and sliding one would expect to hear from a bluegrass fiddler. Neighbors relax on a dilapidated porch and hesitantly pluck their instruments until they launch into a full-on jam in the third section of the title track of this recording, for piano trio. The second movement of the clarinet, violin, cello and piano work, Fractured Jams (2006), “jug band jamboree,” is an exploded hoedown where none of the hesitant musicians can manage to play together. The other movements of Fractured Jams demonstrate Visconti’s modernist side. Random notes and sounds pop like fireworks in imitation of a skipping record, microphone feedback, and bursts of distortion. These extended techniques also show up on the bassoon solo, Ramble and Groove (2009), where a swinging lick establishes a groove only to be continually derailed by burbling growls, squeaks, and clicks. Low Country Haze (2009) opens in a mysterious landscape populated by strange noises. Soon, an up-surging melody coalesces from the mist, and we enter the wide-open expanse that Visconti already traversed so gorgeously on Drift of Rainbows. This is where Visconti most resembles one of his obvious influences, Aaron Copland: magnificent pastoral music inspired by mythologized purple mountains and fields of grain. The naïve Remembrances (2008) for cello and piano is also in this vein, a sentimental hymn to the past. 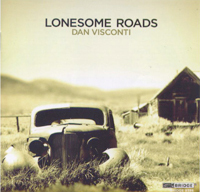 Capturing the spirit of such a vast, eclectic country as America in music without condescending or over-simplifying is difficult, but Dan Visconti does it admirably, as illustrated by this recording. Yet his work so far has nostalgically gazed backward at a supposedly simpler time. He should try his hand at evoking the hyperactive, technology-saturated America of today. On January 14, 2014, the Wasmuth Quartet will perform Visconti’s Ramshackle Songs in Oberlin Conservatory’s Stull Recital Hall and on January 25, the Jupiter Quartet will perform the same piece in Oberlin Conservatory’s Warner Concert Hall. From March 12 to March 16, 2014, CityMusic Cleveland under the direction of James Feddeck will premier Visconti’s new concerto, Roots to Branches, featuring Grammy-winning Silk Road Ensemble percussionist Shane Shanahan.